Video Review is coming soon. If you travel a lot because of work or studies most probably you have been looking on the market for some more audiophile solution on the go. An improvement of the sound going out of your phone or tablet. An amplifier. Ideally a combo of an amp/dac. As an amp it needs to drive easily your favourite headphones to desired volume levels and as a DAC it needs to be a hearable sound improvement from the one you are used to. SMSL has a solution to that. If we look quickly to the past there was a quite successful model called M2 from SMSL but that was a dac/amp without internal battery. And then there was a portable amplifier called SAP-V also very popular but no DAC there. Both those are discontinued and there are new boys in the block in SMSL’s products line up. SMSL IQ is one of them it’s a new gen solution going along with all the current trends, packed with plenty of useful features, hi-resolution sample rates support with impressive numbers when it comes to signal to ratio and dynamic range, but most importantly it’s a portable USB DAC and amplifier with a decent built in battery. 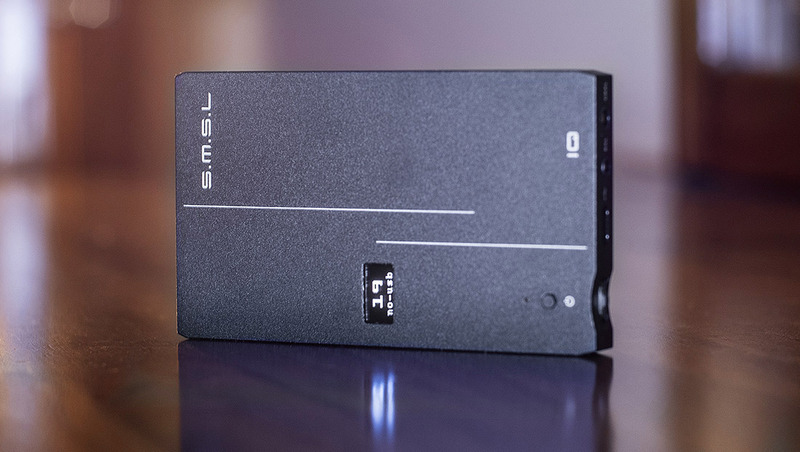 SMSL IQ is a new gen USB DAC/AMP ``on the go`` solution packed with plenty of useful features, hi-resolution sample rates support and impressive numbers when it comes to signal to ratio and dynamic range. SMSL IQ features conveniently both balanced (2.5mm) and unbalanced output . IQ’s useful OLED display shows volume level and current sample rate and also indicates when USB cable is connected or not. As SMSL is known for, the build quality is great. The housing is from aluminium. All ports look solid and as they will last. Even micro USB port which usually is the most fragile one seems dived a bit more in the body of the housing than on other devices I tested and when the cable is connected it doesn’t have that classic wiggly, loose feel but the cable seems very stable and well locked in the port. 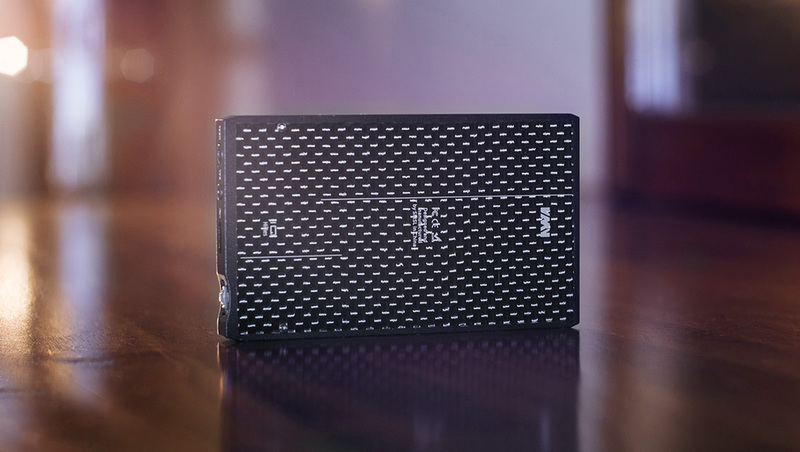 The back of the DAC is quite interesting as SMSL decided to give it a stylish carbon fibre look, which looks interesting and has an extra glass finish on top of it with SMSL branding. Definitely something different looking and I found it as a quite nice aesthetic touch which stands out.. 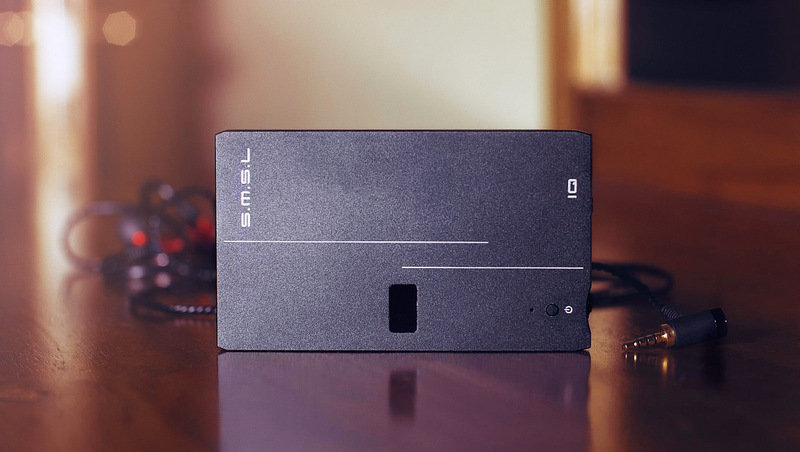 This usb dac/amp features besides a solid amplification and new gen DAC chips a big battery and a 2.5mm balanced and 3.5mm unbalanced output. As is known and common, balanced amplifiers deliver much more power due the doubled signal through the output which is in this case 91mW to 32 ohms in comparison with 55mW through the classic 3.5mm unbalanced output and as the impedance goes up the difference is even bigger (balanced in 300 ohms / 32mW and through unbalanced 12mW) . But the list of features doesn’t end there. IQ also comes with many other useful features as an OLED screen which is fairly bright even in a sunlight. The unit’s menu includes following features: volume control (0-38) , change of the output (balanced/ unbalanced) only one at the same time can be used, charge – on/off, perfect as it doesn’t drain your device battery then, USB transfer switch between 2.0 or just 1.1 for better compatibility with mobile devices (solving easily a problem some people have been experiencing with IDEA and other new gen dacs), adjustment of the screen brightness, PCM filter (short, mini, fast), DSD filter (70, 60, 50, 47 hz). The display always shows a volume level and also a playing sample rate. SMSL IQ has a unique, stylized glass carbon fiber look on the back. You can find on top of the body also LED light indicating charge state (red when charging, blue when charged) and a power button which on short press shows a current level of the battery, on long press switches the DAC off. Volume knob (wheel) is here designed in an interesting way as it’s multifunctional and besides the volume it controls also the menu. So it doesn’t circle 360 around as a normal volume knob but it works in a way of pull right, pull left and press, hold for the menu and click for the menu item selection. Quite untraditional but I have got use to it very quickly. 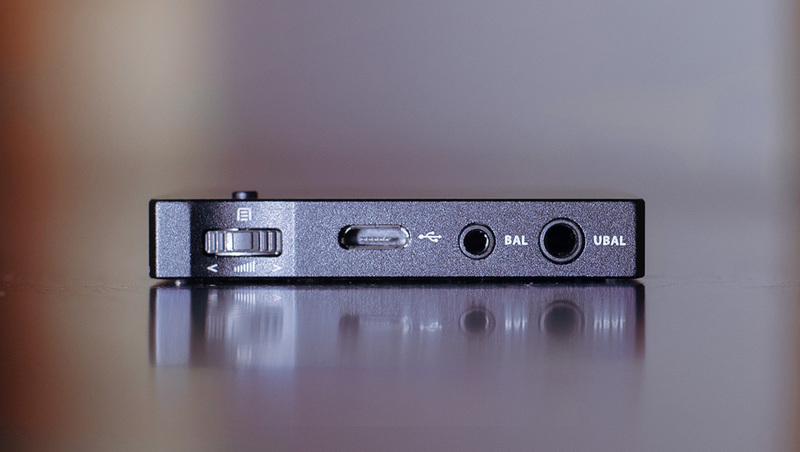 As another chapter from the list of features which comes along with the internals this USB DAC features impressive native 512DSD playback and from the internals is important to mentioned that it features 2 DAC chips each for separate output (balanced /unbalanced) and as a USB solution 2nd generation of XMOS. DAC chips used are Sabre 9018Q2C. This DAC also has two low noise LDOs (linear regulators) Each channel is powered independently, protected from any interference from a power supply. There is also featured a sound mute circuit protecting headphones when connecting, switching the outputs. IQ should be compatible with most devices currently in use and on the market. (both android and apple) Conveniently it features in a menu a possibility to switch between USB 1.1 and 2.0. 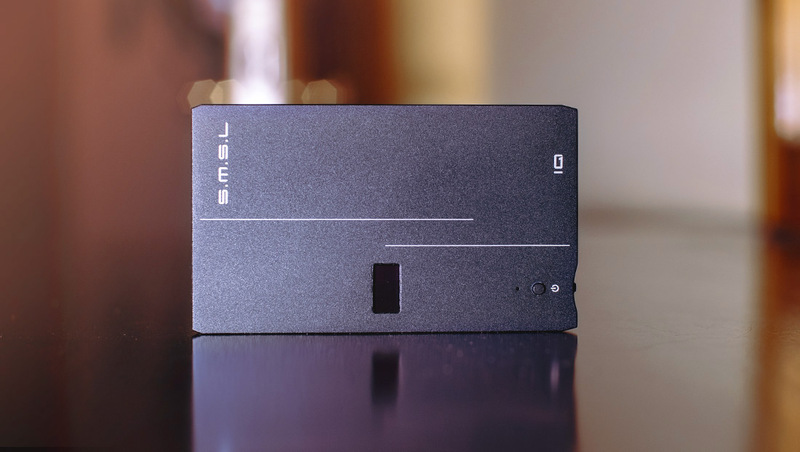 So if you will be experiencing some playback issues as some people have been experiencing with IDEA or other SABRE or other new generation dacs, buzzing noise or transfer data skips just switch to 1.1. and you should be just fine. I tested this DAC on two different phones (Samsung S8 and new Sony Xperia) and I had not issues even with 2.0 selected. However, as expected this DAC didn’t work on an older tablet with android 5.0. The compatibility goes 6.0 and above. With switching the USB transfer protocol to 1.1 keep in mind that it limits also the supported sample rates support due lower data transfer capability to 24bit only and also DSD is not going to work in 1.1 selected. On a computer I had absolutely no issues (windows 10) . DAC was recognised and ready to go immediately. But for native DSD playback you will need to install a custom Xmos driver which SMSL provides on their website. After installing the driver DSD playback works seamlessly. Native DSD playback works seamlessly but requires to install customised Xmos drivers (download available here) I tested with 256DSD and other 64DSD files and there were absolutely no issues without a need to adjust anything. In Foobar2000 select as an output DSD:ASIO USB DAC ASIO or you can go trough classic known way with selecting DSD: ASIO foo_dsd_asio and then in ASIO section in those drivers select USB DAC ASIO (that’s how the dac’s drivers are named by the system). Works both ways. There is a simply Driver control panel which comes with the Xmos driver which shows current sample rate and allows to change for example a buffer and other if you would need it which is handy. When it comes to the in-build battery I measured 8-9 hours of a battery life. Tested with an unbalanced output, 62ohms headphones and 85 percent of the volume all the time. To fully charge the battery back took via laptop’s USB port around 2.5-3 hours. If you use some own dedicated wall adapter then it should be even faster. These results are in my opinion pretty good and should be enough for most users. The DAC always switches on when connected to a device (pc, mobile and other) automatically but needs to be switched off manually via power button when disconnected otherwise it stays on. Also important to note: if you select not to charge from the connected device and the dac goes out off the power it switches off and needs to be reconnected as it remembers not to charge and will not switch to charge automatically then. The feature of having both balanced and unbalanced output is very convenient and future proof. As you might know the main advantages of balanced output is not just the extra protection against an interference and noise for the actual signal traveling in longer distances but also the signal to each channel is in a case of balanced output duplicated so the amount of power delivery is almost double in comparison with unbalanced output. 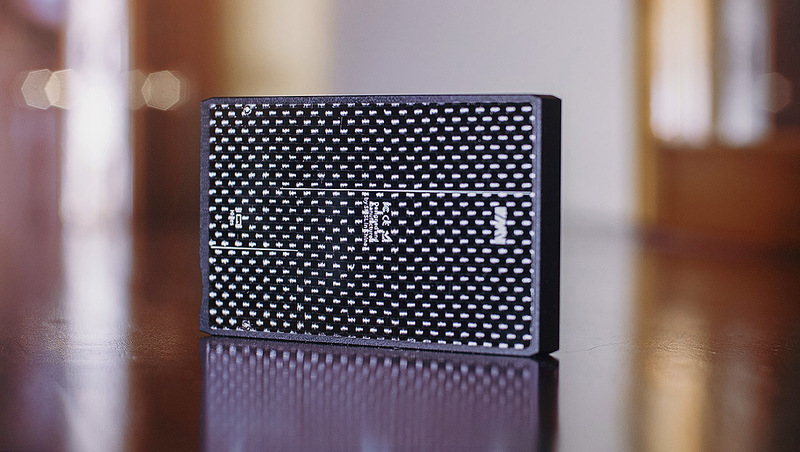 What you can expect with this portable amplifier even with unbalanced output the power delivery is very solid. This amp is capable to power most of the headphones on the market. I still recommend for unbalanced max 150 ohms as you never should go with any amp higher than 70 percent of its power. For an example with AKG 702 (62 ohms, unbalanced output) I have got reasonable listening very good loudness on 70 percent of its power and at volume level 30 (max is 38) very very loud result. With balanced output I have listened to couple of IEMs which I have had available during the testing and for most of them the volume level 6-7 was as expected super loud due their low impedance. As it goes in audiophile world, better part of equipment you buy or upgrade to really hear the listenable difference you have to understand that each part of your system and pairing of the components should match and matter to final listening result and final listening experience. So in other words better DAC you buy you to really appreciate and hear the difference in sound quality you need a matching headphones or speakers to be capable to reveal that resolution, dynamics and other. The well-known nature of SABRE chip based DAC is to be a bit brighter overall and especially on highs and I can confirm that slight brightness in this case too. But it is not necessarily a bad thing. If you pair it well you actually can benefit from it. I tested this DAC on my main listening system (system description at the end of the article) and also with a variety of headphones and the sound was more than pleasing experience. The differences in comparison for example with SMSL Sanskrit 6th are very clear. IQ is a step above in a way of a resolution and clarity. Don’t get me wrong Sanskrit is still a great 100 dollars standard in my opinion but in comparison with IQ feels like holding back in every way – spectrum of music frequencies reproduction. IQ delivers more detail and resolution. You can hear how everything lights up and steps towards to you. In comparison Sanskrit is like living in a calm, still pleased, slightly “warm” but (analytical to warm) foggy weather and IQ lives a clear very sunny environment instead. Yes you heard me, I said Sanskrit really seems warmer in this case because of its kind of melting harmonically between the frequencies but only with a comparison with IQ. With IQ all is clearer, you can hear and almost even imagine the sound in separate layers as it was composed and before the final mastered output was done by the sound engineer. Each music instrument, vocals, all seems has its clear place and depth, wide position. I think sometimes some people confuse brightness with a clarity and mislead people then, but it is not the case here. Even with AKG 702s which are quite known for their highs and not good to match with SABRE DACs I didn’t hear any harshness or bigger impact on highs (still better than Byerdynamic headphones though). The only thing I have to say is IQ seems to me slightly roll off the very low-end. Otherwise the whole frequencies seem well presented, natural and the sound feels balanced, airy enough with great soundstage and imaging, positioning. The sound is not warm but it is not also too cold or very bright. It is more on the neutral side with that edge sharpening, delivering great clarity and detail for the price. For me what always matters most is the sound and SMSL IQ delivers to my ears very pleasant detailed sound with enough of resolution especially for the price. The advantage of both balanced and unbalanced output is for me clear and also important benefit going along with other functionality and the well welcome display is a plus. DSD playback works seamlessly. Battery life is also quite very good and overall what you are getting here is a great package full of real life useful features and great engineering. Do I recommend this product in this price range for the sound and other features it offers? Yes. Absolutely.